TORONTO – You would be forgiven for associating Sun Chemical with only one part of the manufacturing process – after all, the Parsippany, New Jersey-based company, which has roots in a Paris business founded 200 years ago but was incorporated in its current form in 1945, has long been known as the best colourist in the business. But during her presentation and speaking with ITBusiness.ca afterward at industry association Intelliflex’s 2018 Canadian Printed/Flexible/Wearable Electronics Symposium (CPES), Sun Chemical electronic materials technology manager Erika Rebrosova barely mentioned colours at all. And so in a textbook example of self-disruption, Sun Chemical’s electronic materials division has found success in four sectors, three of which have little relation to its longtime market: printed circuit boards (PCBs); solar cell fabrication; and, hence the company’s appearance at CPES, printed electronics (the fourth is low-temperature co-fired ceramic – LTCC – inks). That isn’t to say the company has abandoned its area of expertise: Its PCB division has long produced the familiar green or white coating seen on many PCBs, and all four sectors draw on Sun Chemical’s history of developing new materials – the solar cell division, for example, produces a variety of low-cost pastes, insulators, and resistance materials for manufacturers. “We’re utilizing our expertise in pigment development, ink and coating formulation, and printing technologies in developing advanced material solutions for additive manufacturing of electronics, and it is a fantastic fit,” Rebrosova says. The company’s flexible and hybrid electronics division, meanwhile, produces silver- and carbon-based conductive inks; carbon graphite; ultraviolet and solvent-based dielectrics; and even biological and agricultural sensors capable of identifying measurements such as glucose levels. “We’re always scouting what’s new out there,” Rebrosova says, citing Sun Chemicals’ acquisitions of startups such as U.K.-based biosensor manufacturer Gwent Group, and nanotechnology manufacturer NanoMas Technologies, whose expertise the company has used to launch a line of nanosilver-based products. 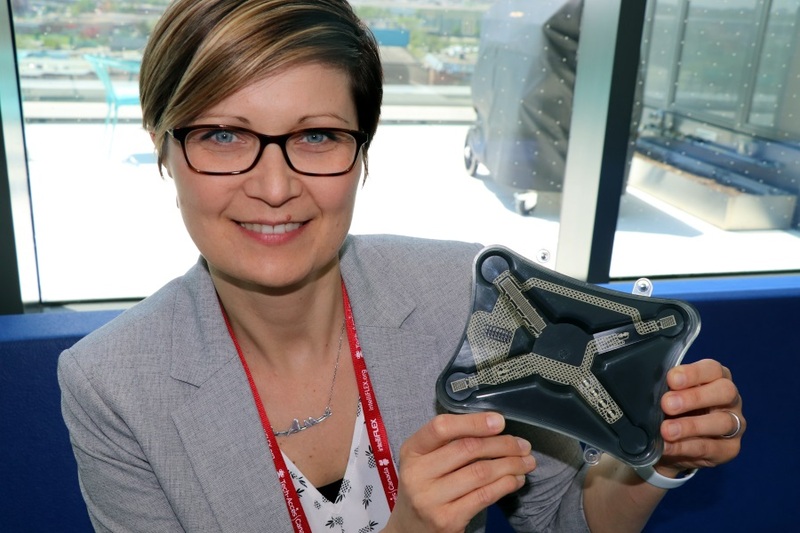 During her appearance at CPES, Rebrosova spent the majority of her time showcasing what she called one of Sun Chemical’s most promising printed technologies: In-Mold Electronics (IMEs). These devices, which embed electronics into printed plastic, could have wide-ranging effects on the automotive, medical, and wearable technology sectors to start. The devices she demonstrated at CPES included touch sensors capable of activating LEDs, and could be opened for curious journalists wondering what their wiring looked like. Rebrosova showing off one of Sun Chemical’s IME demo boards; what looks (and feels) like a smooth painted surface is actually a series of embedded circuits and LEDs. Touching the corners of the board on the other side turns on the lights. More importantly, Rebrosova said, the technology enables the integration of “smart” features into “dumb” surfaces; for example, adding switches and lighting to decorative panels inside a car.